Many thanks from all at Caring Together to those members of the Grove Methodist Church In Horsforth who kindly brought 6 boxes of foodstuff to our offices this morning. This was some of the food collected as part of their Harvest Festival Festivities which they asked to be distributed among older people in Woodhouse and Little London.More details of the activities of the church can be found on their website: http://grovemethodist.org.uk. 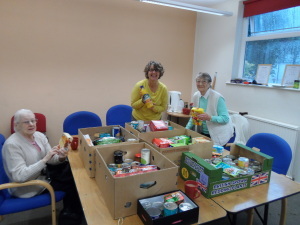 The picture shows some of the members of our Reminiscence Group helping to sort through the donation. ← Older People’s Day – Let’s Do it!